It is unanimously accepted that disorders of the Eustachian tube More Details contribute to the development and course of middle ear disease and its variants. ,, Hence, pathophysiology of the Eustachian tube bears paramount importance and also remains a challenge to the most astute and experienced otologist, who tries to reconstruct diseased ears. For this reason tubal function must be diligently checked in all patients with tympanic membrane or middle ear defects before reconstructive middle ear surgery. There exists a constant physiological tendency toward creation of negative intra-tympanic pressure ascribed to absorption of oxygen by the mucosa. A perfect and lasting operative end-result with adequately aerated tympanum could only be achieved if there occurs intermittent opening of the Eustachian tube, since this overcomes the acquired negative pressure and restores the middle ear pressure to normal. Being in continuity any pathology in the nose and nasopharynx is likely to affect the Eustachian tube, and thereby jeopardize its normal functions and imminently of the middle ear also. It is thus of interest if a tubal function test can quantify the tubal function deviations from normal and can also prognosticate the probable results of reconstructive middle ear surgery. The aim of this study is to evaluate the ventilatory function of Eustachian tube in chronic suppurative otitis media cases (inactive stage) by tubal manometry, planned to undergo middle ear reconstruction and, hence to relate them with similar past experiences. The present study consists of 29 cases of chronic suppurative otitis media (tubotympanic type) destined to myringoplasty/tympanoplasty. All patients were taken from Department of Otorhinolaryngology and Head and Neck Surgery during the period of August 2004 to November 2005. A complete history was taken and a complete local, general and systemic examination was carried out in all patients. Otoscopic findings were noted concerning tympanic membrane perforation - site and size, color of ear drum remnant, any tympanosclerotic patch, condition of middle ear mucosa, condition of ossicles, Eustachian tube orifice etc. A ''U''- shaped glass tube was filled with mercury and the tube ends were calibrated above the meniscus of the mercury [Figure 1]. Then, one arm of U-tube was joined to one arm of a Y tube connector via a rubber tube. The second limb of the Y-connecter was attached to a No. 14 Foley catheter and the third, remaining arm of the Y-tube was attached with a calibrated 2 c.c. syringe. The calibrated syringe is meant for applying either a positive or a negative pressure, not to exceed 30 mm of mercury. If the applied negative pressure is completely neutralized after swallowing, then the tubal function is assigned normal functioning. In a hypo functioning tube the residual negative pressure, which remains in system after ten swallows, is arbitrarily termed as the functional capacity of the tube under negative pressure. When applying positive pressure, the patient is advised not to swallow and the air is pushed inward by calibrated syringe. The least amount of positive pressure needed to open the Eustachian tube passively is the functional capacity of the tube under positive pressure. Thus all the patients were classified in following groups according to following criteria [Table 1]. The present study includes 29 dry cases of C.S.O.M. with a central perforation having unilateral or bilateral disease. Preoperative Eustachian tube function in these cases was assessed by B-M apparatus. These 29 cases were divided according to their respective grades of tubal function [Table 1]. 15 out of total cases completely equalized the applied pressure, 12 cases had hypofunction, while 2 had non-functioning tubes. The average swallows required to equalize negative (-ve) pressure was 5, whereas the average positive (+ve) pressure to open the tube was 26 mm Hg. The physiological function of the tube is divided into three parts. First, its pressure equalizing function. Under normal conditions gases in the middle ear are slowly absorbed creating a negative pressure in the middle ear cleft. The tube, which remains collapsed at rest, opens intermittently and permits the passage of air from the nasopharynx into the middle ear thus equalizing the pressures. If the pressure gradient is reversed, air may pass in the opposite direction from the middle ear to the nasopharynx. Second, its drainage function. This function bears significance in middle ear surgery since adequate clearance of middle ear hastens healing of mucosal epithelium, whereas poor drainage yields poor outcome. Third, its protective function. The resting tube protects the ear from noise and pressure changes in the nasopharynx, and perhaps acts as a barrier to infection. Hypofunction of the tube leads to a conglomerate of pathologic changes of the middle ear and hearing disorders. Acute and chronic inflammatory processes involving the mucosa of the middle ear cleft as a whole and presence of small lymph follicles in the tubal lumen account common causes of obstruction or inadequate patency of the tube. Hypofunction of the Eustachian tube leads to serous otitis, which often heralds onset of acute otitis media, eventually resulting in acute mastoiditis or turning into chronicity and produce tympanosclerosis, cholesteatoma, or mastoiditis. It seems prudent to precisely determine the tubal function preoperatively in perspective of extent of its variability in chronic otitis media cases, as it is purported to be predictive of the outcome of reconstructive middle ear surgery. The "negative middle ear pressure test" as assessed by BM apparatus seems undoubtedly useful as screening method in primary setup, where tympanometric facilities are not available, in decision making regarding appropriate time and suitable surgical candidacy of a perforation closure by myringoplasty. It is at present felt that provided a middle ear is, by microscopic examination, both dry and showing no evidence of any active inflammatory process, it is wisely advisable to close a perforation in the presence of "good" or "moderate" grades of Eustachian function. Patients who cannot reduce a negative pressure applied to the middle ear are much less likely to have a satisfactory surgical outcome, although not necessarily, from myringoplasty and this risk must be explained prior to the candidate before contemplating surgery. 1. Miller GF Jr. Eustachian tube function in normal and diseased ears. Arch Otolaryngol 1965;81:41-8. 2. Holmquist J. The role of Eustachian tube in myringoplasty. Acta Otolaryngol (Stockh) 1968;66:289-95. 3. Bluestone C, Cantekin E, Douglas G. Eustachian tube function related to the results of tympanoplasty in children. Laryngoscope 1979;89:450-8. 4. Sen S, Guha S, Biswas A, Ghosh LM. A comparative study of methods of evaluating Eustachian tube function in chronic suppurative otitis media. Indian J Otol 1999;5:67-70. 5. Zoellner F. Widerstandsmessungen an der ohrtrompete zur prufung ihrer Wegsamkeit. Arch Ohr Nas Kehlk Heilk 1935;140:137. 6. Flisberg K, Ingelstedt S, Ortengren U. Controlled ear aspiration of air: A physiological test of the Eustachian tube. Acta Otolaryngol Suppl(Stockh) 1963;182:35-8. 7. Bortnick E. A simple apparatus to measure Eustachian tube function. Arch Otolaryngol 1966;83:12-3. 8. Siedentop KH, Tardy ME, Hamilton LR. Eustachian tube function. Arch Otolaryngol 1968;88:386-96. 9. Dasgupta KS, Joshi SV, Mane SB, Rotte VV. The Bortnick Miller apparatus: A useful alternative to impedance audiometer for assessment of Eustachian tube function in chronic suppurative otitis media. Ind J Otol Head Neck Surg 2009;61:135-7. 10. Singh M. Bortnick- Miller apparatus as reliable as pump-manometer portion of impedance bridge for testing ventilatory function of Eustachian tube in chronic suppurative otitis media. Ind J Otol Head Neck Surg 1989;41:164-5. 11. Moustafa HM, Abdel-latif SM, Shaaban BM. 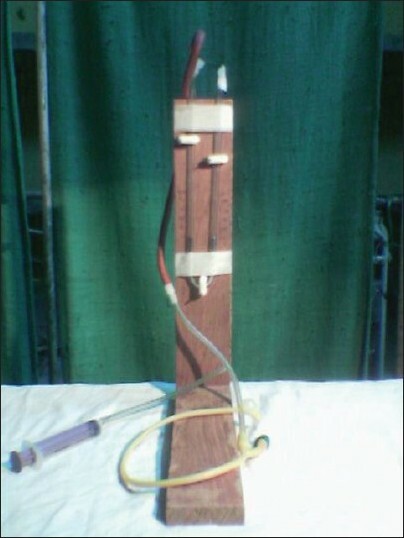 A simple apparatus for the assessment of Eustachian tube patency before myringoplasty. J Laryngol Otol 1979;93:39-42. 12. Bhat VK, Kumar PR, Nag M, Hegde J. Comparison of a Eustachian barotubometer with a tympanometer to evaluate Eustachian tube function in chronic suppurative otitis media. J Otolaryngol- Head Neck Surg 2009;38:456-61. 13. Mittal VK. Assessment of Eustachian tube functions in patients with ear drum perforation. Indian J Otolaryngol 1985;37:23-25. 14. Miller GF, Bilodeau R. Preoperative evaluation of Eustachian tubal function in tympanoplasty. South Med J 1967;60:868-71. 15. Mackinnon DM. Relationship of pre-operative Eustachian tube function to myringoplasty. Acta Otolaryngol 1970;69:100-6. 16. Flisberg K. Ventilatory studies on the Eustachian tube. A clinical investigation of cases with perforated ear drums. Acta Otolaryngol Suppl (Stockh) 1966;219:1-82. 17. Gersdorff MC. An exploration method of the Eustachian tube for intact and perforated drums. Tubal impedance manometry. Arch Otol Rhinolaryngol 1977;217:391-407. 18. Kacker SK, Sinha A, Dutta NN. Eustachian tubal function in health and disease. Indian J Otolaryngol 1971;23:163-75. 19. Srivastava AC, Gupta SC, Singh AP. Efficacy of various methods in evaluation of Eustachian tube function. Indian J Otolaryngol 1993;2:188-90. 20. Thompson KA. Investigations on tubal function. Acta Otolaryngol Suppl 1958;140:269. 21. Perlman HB. Physiological basis for tubal function tests. Arch Otolaryngol 1960;71:384-5. 22. Ekvall L. Eustachian tube function in tympanoplasty. Acta Otolaryngol Suppl 1970;263:33-42. 23. Sharp M. The manometric investigation of tubal function with reference to myringoplasty results. J Laryngol Otol 1970;84:545-51. 24. Kumazava T, Iwano T, Ushiro K, Kinoshita T, Hamada E, Kaneko A. Eustachian tube function tests and their diagnostic potential in normal and diseased ears. Acta Otolaryngol Suppl 1993;500:10-3.